DETRAC provides expert guidance on selecting the best rapid prototyping (RP) technology to meet customer requirements. With its many years of prototype engineering and development experience, combined with its knowledge of new technologies and techniques in the prototyping industry, it has helped assist customers in selecting the appropriate technologies and processes to create engineering prototypes. DETRAC is also able to assist industrial and research communities by research and development collaborations in projects that are strategically important in the areas of science, engineering and technology; from which successful new products, processes and services can emerge. The prototype Remote Weapon Station (RWS) model developed by DETRAC can be mounted onto a wide range of armoured vehicles. It is designed to accommodate the Browning M2 HMG, 12.7mm calibre and a grenade discharge rack which has the capacity for 8 units of 40mm automatic grenades, including both smoke and explosive. 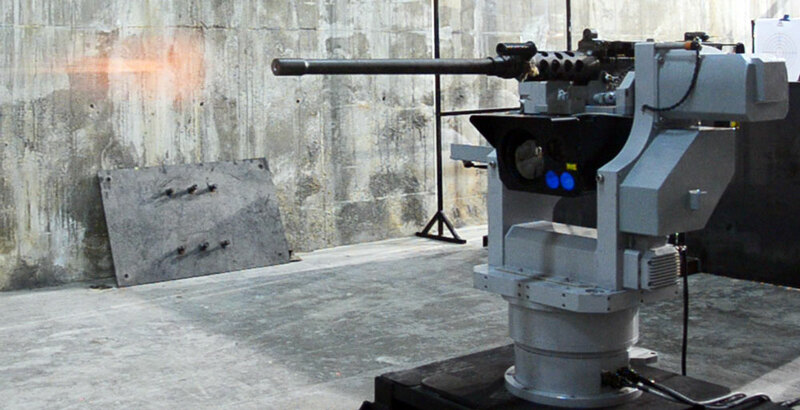 This system is electromechanically controlled with dual axis drive to support the gun for unlimited 360° pan angle rotation and tilt angle rotation between -20° and 60°. The grenade rack is only controllable along the pan axis which can simultaneously launch 4 grenades at a time. This system is fully stabilized for firing on the move and firing at moving targets. The sighting system is equipped with Day and Night infrared CCD camera, Thermal Imager and Laser Range Finder 1km which guarantee field surveillance, target acquisition and combat by day, night or under poor visibility. An advanced integrated electro optical system with various features that is able to capture, display, record video or images simultaneously during flight operations either on a UAV or a Patrol Craft.Consisting of a multi spectral imaging camera, video camera, laser range finder, on board computer controller system, full motion video and FMV network broadcaster, the EO500 is a tested and proven EO system developed indigenously by DETRAC.With the multi spectral imaging camera, the system is able to capture still RGB and IR images. Combined with the video camera, the system can provide live preview video which is encapsulated KLV metadata. Equipped with the laser range finder, the EO500 is able to provide real-time accurate target range data to the end user.The EO500 has been proven to operate within tropical conditions with current flight duration of up to 150 hours. The RETINA SR3000 is designed to meet the needs of military surveillance and reconnaissance operations that uses rotary and fixed wing aircrafts. Through superior stabilization Day and Night CCD camera, Digital Camera and Laser Range Finder the RETINA SR3000 provides high performance detection, recognition, identification and target locking of vehicle over long distance in daylight. Being small in size and light weighted RETINA SR3000 can be installed on a wide range of aircrafts and UAVs that needs compact and user-friendly systems. This system is equipped with a video recorder, data storage for digital images, digital map, GPS tracking and a joystick for controlling the camera’s direction and zoom. The FCS 7000 Coastal Surveillance System creates real-time Common Operating Pictures/Recognised Maritime pictures by providing detection, classification and identification of cooperative and non-cooperative vessels. This system is able to assist in detecting coastal threats that is essential in pushing for fast responses on land so that assets can be deployed if necessary. Having it developed in Malaysia, the system is highly customizable. It can be integrated with coastal radars and could be mounted on lighthouses or towers. The FCS 7000 is able to complete operational picture up to 15km sea level. This second line test set system was developed indigenously by DETRAC. This tester has the capability to test the serviceability of the UV-30MK.8700 dispensing unit. This tester has undergone development phases including algorithm study, data simulation and series of functionality test on Sukhoi Aircraft CMDS unit.The small form factor enables this tester to be mobile-ready and easy to use with conventional single power supply of 240V 50Hz. Wireless Remote Initiator (WRI) is an essential equipment in Explosive Ordinance Disposal (EOD) and Improvised Explosive Devices Disposal (IEDD). Nevertheless, this equipment is also used in non-military operation such as blasting during mining operations and building implosions for controlled destruction. This junction box for GPS satellite transceiver (DMR800) was custom developed for our client, PT SOG who provides Vessel Monitoring System for the Indonesian Maritime Agency. It provides uninterruptable power supply for the DMR800 and safety features such as temper proof and emergency warning system. The Equal Channel Angular Pressing (ECAP) machine was custom developed for a research project done in University Science of Malaysia. This equipment is used to study the inﬂuence of equal channel angular pressing (ECAP) process on compressed aluminium micro structure.The aluminium rod is pushed through angled pipe with 30 tonnes of force several times and this increases its strength since the micro structure of the aluminium rod is compressed. Developed for University Science of Malaysia, this composite curing oven is numerically controlled and has a vacuum supply and temperature control feature that can be utilised during the composite curing process of medium to large sized composite parts. This machine is equipped with a vacuum hose of 12 and functioning vacuum ports of 12, temperature sensor and pressure sensor on laminates to monitor the temperature distribution and vacuum during the curing process. OPRID was developed for University Putra Malaysia. It measures the spectral reﬂectance and absorption of light to measure the ripeness level of oil palm.